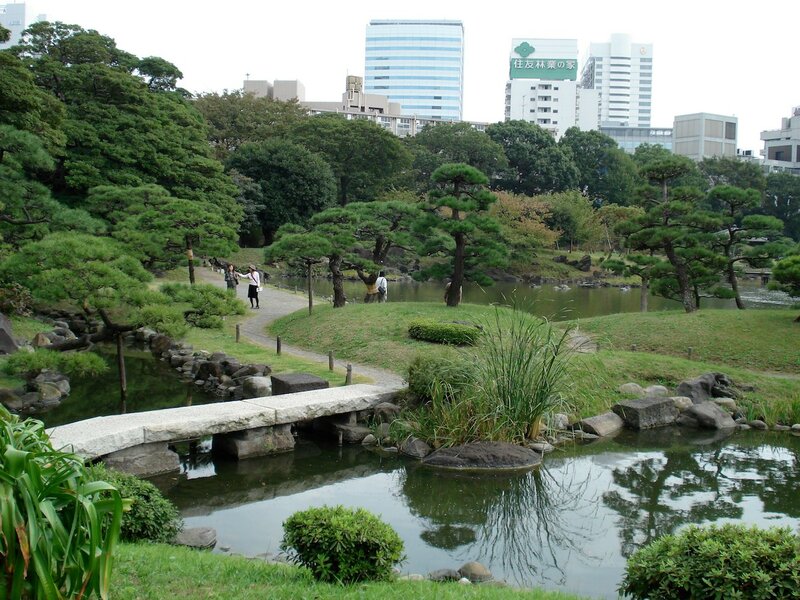 The Kyu-Shiba-rikyu Gardens are one of two surviving feudal era Japanese gardens in Tokyo today. 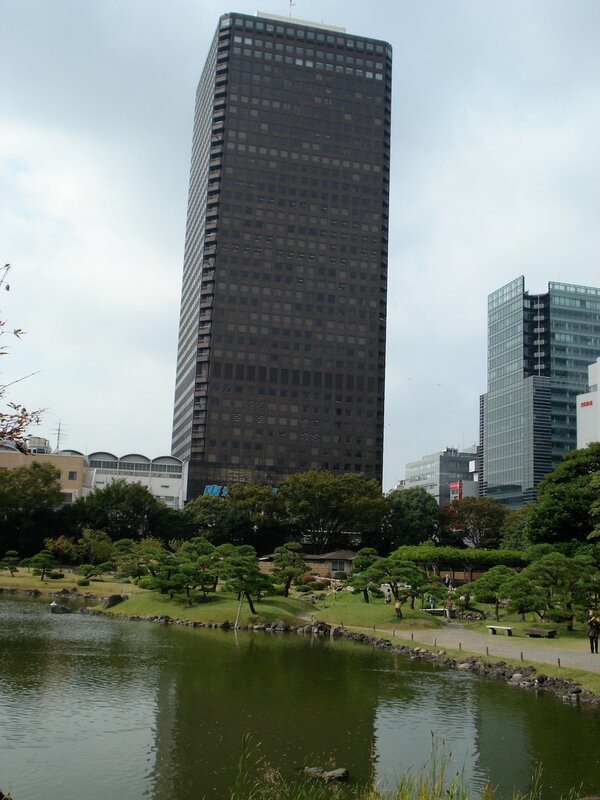 It is located next to JR Hamamatsucho Station to the south of Tokyo Station and east of Tokyo Tower. 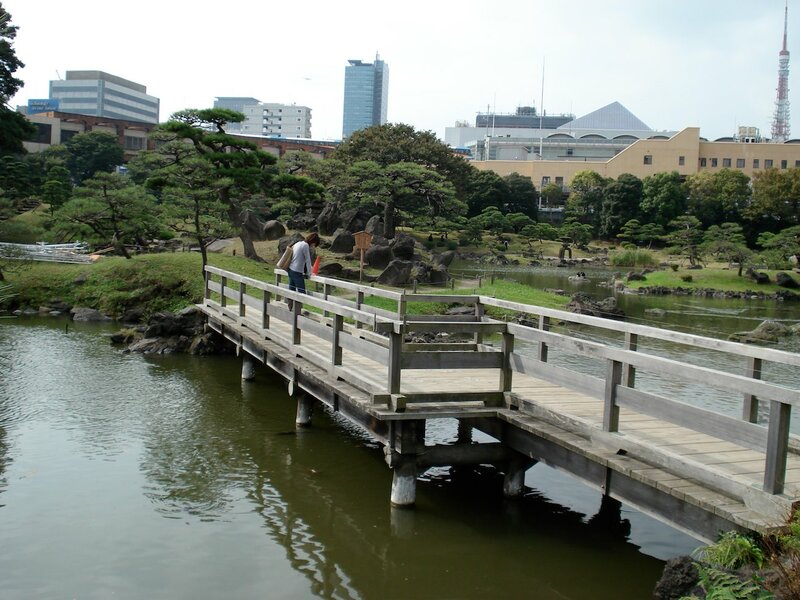 The Hama-rikyu Gardens to its north is the only other garden from this era left in Tokyo. The garden is built to be enjoyed by slowly walking around it and considering its scenery from different angles. This type of garden is referred to as a circuit style garden. 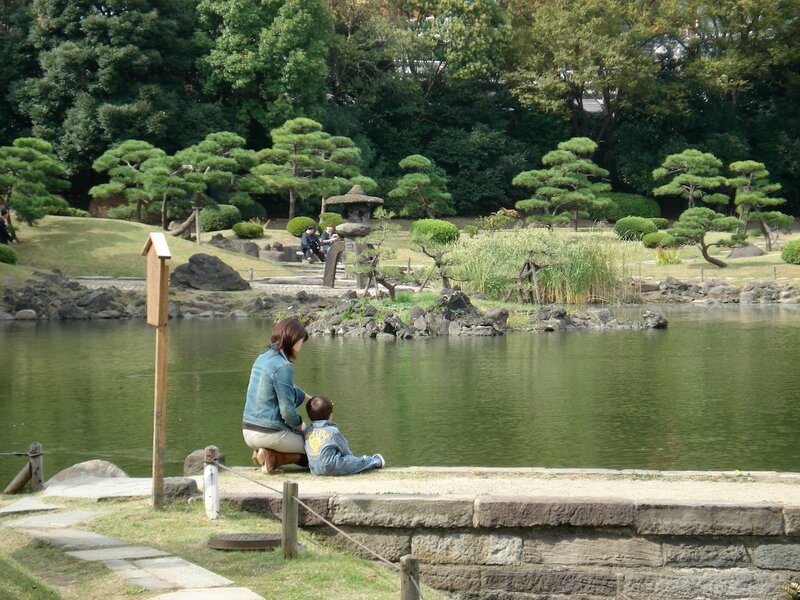 The main feature of the Kyu-Shiba-rikyu Gardens is Sensui pond (9,000 m). It's so large that it takes up almost a quarter of the garden's 43,070 m. Four large islands float on the water and two can be reached by bridges. It was originally a salt water pond with sea water being exchanged with an ingenious lock system to maintain a stable water level. When the ocean inlet was made high and dry by additional land reclamation, the lake was converted to fresh water and now contains the normal assortment of carp. Honestly, there's not one boring vantage point in the garden. There is a large stone lantern specifically for snow viewing. Oyama, the highest hill in the garden, let's you get a good look at the entire garden. Nakajima (or middle island) is an excellent center piece and apparently modeled after Seiko Lake (Xi Hu). There is quite a wide variety of terrain in the park from grassy picnic areas to stone walkways to sandy beaches. Finally, It's not really a flower garden but there is a wisteria trellis and a number of blossoms. The land around the garden has a relatively short history as it was part of the shallows of Tokyo Bay until it was reclaimed from 1655 to 1658. It was Okubo Tadamoto, a high level official in the Tokugawa Shogunate, who oversaw the construction of the garden by his staff after the surrounding land became his official residence in 1678. 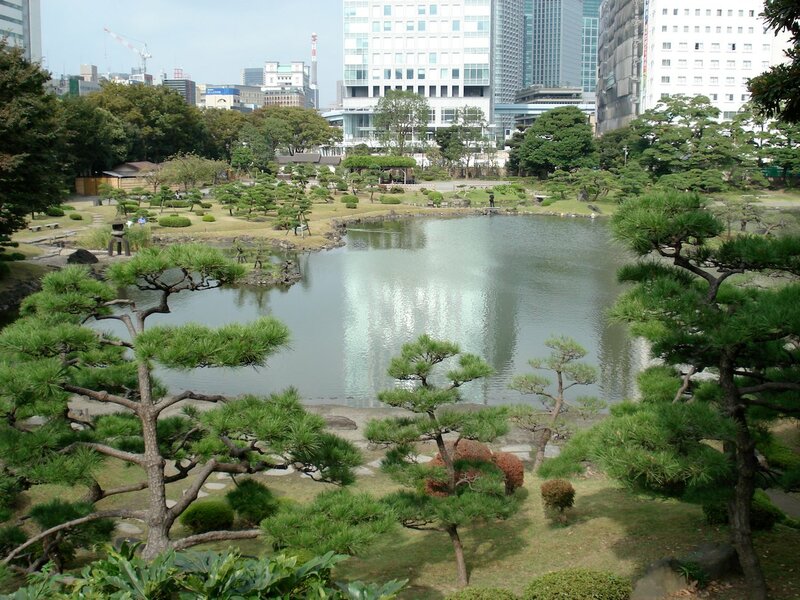 The garden was originally known as Rakujuen and was part of a samurai style residence that he moved into from Odawara. The villa and its garden changed hands many times until, notably, the Kishu branch of the Tokugawa family in the twilight years of their rule bought it. In 1871, it became the residence of the Arisugawa-no-miya family who sold it to the Imperial Household Agency in 1875. From then, it became known as the Shiba Detached Palace. The horrific fires after the Great Kanton Earthquake which struck on September 1, 1923 took the buildings and nearly all the trees. 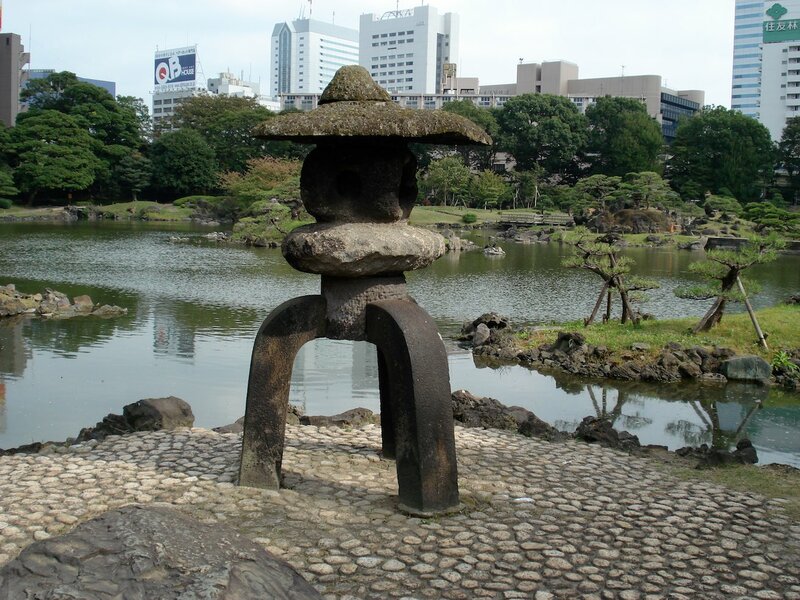 The Kyu-Shiba-rikyu Gardens were presented to the City of Tokyo on January 1, 1924 as part of the commemoration of the beginning of the reign of the Showa Emperor. Restoration of the grounds was completed by April and the gardens have been open to the public ever since. It was designated place of scenic beauty and historic interest in June, 1979. The north east corner of the garden has a small archery range which is used by local residents. It can be used for 140 yen an hour but there is no instruction or equipment rental offered. 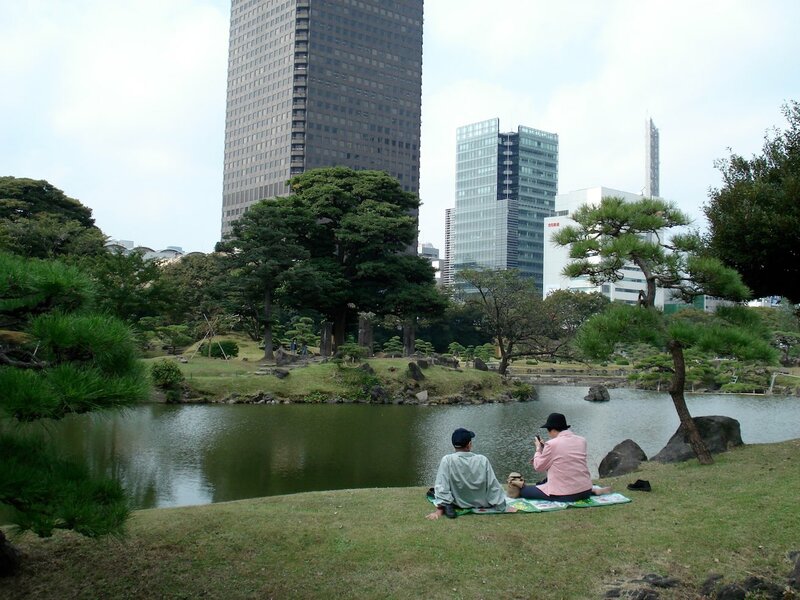 The Kyu-Shiba-rikyu Gardens are an excellent place to refresh yourself or have a picnic lunch. In general, it is well kept up, it is conveniently located and a cheap attraction. There's a nice grassy field and plenty of places to sit and relax. The biggest downside to the garden is that very little room separates it and modern Tokyo. The drab and gloomy World Trade Center Building looms over the north side of the park. I'm sure there's a fine poetic remark waiting to be made about the park's butting up against JR Hamamatsucho Station and the Shinkansen Line, but, I couldn't think of one due to the noise. The gardens have the dubious honor of being right beside JR Hamamatsucho Station. This station is used by the Yamanote, Keihin Tohoku and Tokaido Lines. Hamamatsucho is south of JR Tokyo Station and a east of Shinagawa. The station is also the terminus for the Tokyo Monorail line to Haneda International Airport. The easiest way to get there from other parts of Tokyo is on JR's Yamanote trains (light green) which loop around Tokyo. Daimon Station is just west of the JR station and is used by the Toei Asakusa and Toei O-edo Lines. 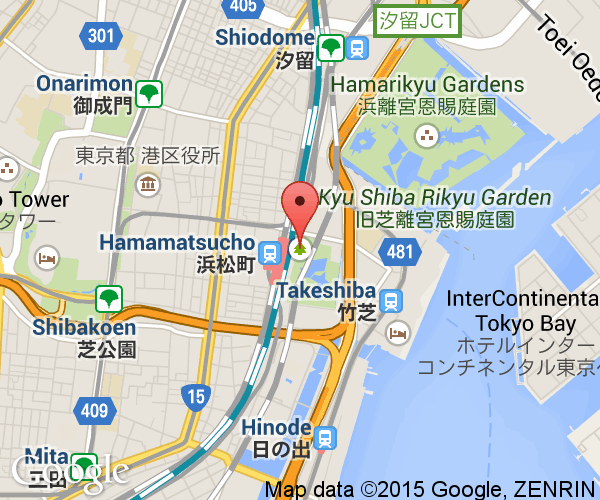 For good measure, the Yurikome Monorail's Takeshiba Station is a 10 minute walk east from the park. From JR Hamamatsucho Station, simply use the north exit from the station, turn right at the street and walk through the underpass to reach the entrance.